Interstate 420 represents a planned southern bypass of the Atlanta Central Business District by way of the Lakewood Freeway (Georgia 166). The Interstate was to run east from I-285 in west Atlanta along northern reaches of East Point to reenter Atlanta through Lakewood Heights. This portion was built in the mid-1960s and signed as Georgia State Route 166. The remainder of the route east to Interstate 20 near Gresham Park was unconstructed. 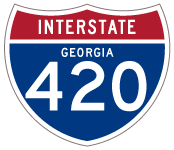 Interstate 420 was approved by AASHTO on June 17, 1975. It was never signed along the Lakewood Freeway however, with I-420 dropped on the Georgia Official Highway Map in 1985. The freeway was renamed Langford Parkway in 1995 to honor Arthur Langford, Jr., a former Georgia State Senator and Atlanta City Councilman. Pryor Road spans Langford Parkway midway between the Downtown Connector (I-75/85) and the freeway end at Lakewood Avenue. Photo taken 08/22/03. Roadway stubs appear at the half diamond interchange with Lakewood Avenue for the unbuilt extension of Interstate 420 east to I-20 near Exit 63. Photo taken 08/22/03. Lakewood Avenue eastbound at the entrance ramp for SR 166 (Langford Parkway). Photo taken 08/22/03. Leading away from Lakewood Avenue, Georgia 166 enters the cloverstack interchange with I-75/85 north to Downtown Atlanta and south to Hapeville and Hartsfield-Jackson Atlanta International Airport (ATL). Photo taken 08/22/03. One half mile south of the three quarter cloverleaf interchange where Interstate 420 would have connected with the Perimeter Highway. Georgia 154 was realigned onto Langford Parkway in the mid 1990s. It overlaps with Georgia 166 east to U.S. 29 (Lee Highway) at Fort McPherson. Photo taken 08/22/03. Exit 5A departed from I-285 north for Langford Parkway east. Georgia 154 (Campbellton Road) ties into Georgia 166 (Langford Parkway) as an at-grade roadway west of Interstate 285. Photo taken 08/22/03.